The Tales series has seen a lot of games released, with a new game seeming to drop every two or so years. Hell, we have seen more than one in the main series drop in the same year, and surprisingly most of the games are of a high quality despite this high turn around. 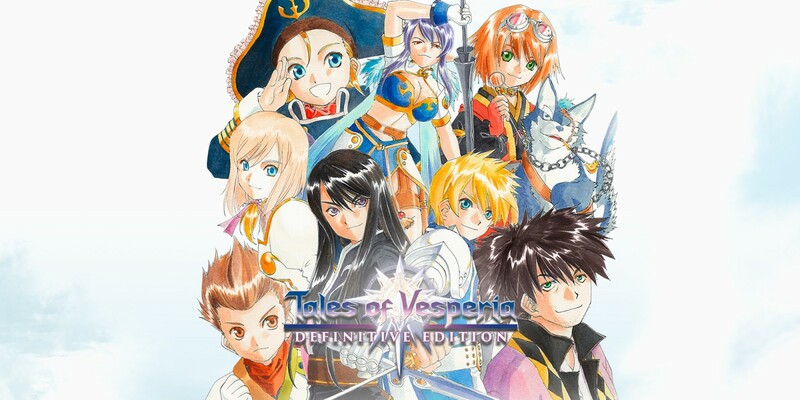 One of the brightest spots came back in 2008 though, when Tales of Vesperia released on the Xbox 360. There was a PS3 version, but that was Japan only and released after the Xbox version, though it did add some extra content. We in the West now get to experience that extra content in Tales of Vesperia: Definitive Edition. This game follows the story of Yuri, as he attempts to reclaim a blast core that was stolen from the poverty-stricken lower quarter of his city. Doing so ends up with him getting arrested and thrown in the castle jail, where a series of events take place that sees him breaking out, saving a girl (Estelle), and leaving his city to find the blast thief whilst also tracking down his longtime friend Flynn. Along the way, you meet an eclectic cast of characters, and the story shows some interesting twists and turns. For a simplistic ‘recover the lost item’ story line, the game does an excellent job of making things interesting. There is always some problem or mystery to solve, which keeps you engaged in what is going on. The biggest strength though lies with the game’s characters. Each one has an interesting personality and back story, which all flesh out over time. This is all led by the protagonist Yuri, who I believe is among the great JRPG protagonists of all time. The gameplay in Tales of Vesperia is that of an action JRPG. You traverse around towns in a 3D environment, entering buildings, talking to the townsfolk etc. When you leave a town, you then enter a world map, which is more zoomed out, and you can encounter enemies which you see wandering around. There are also dungeons, which make up the bulk of the “levels” so to speak. The battle system is quite in-depth and a lot of fun. You battle enemies in real time just like an action game, though the perspective is more reminiscent of a fighting game. That is, you are on an almost 2D plane, moving left and right as you engage the enemies in combat, though if you hold down the left trigger you can move around the arena freely, giving you the whole 3D plane to explore when you need it. Attacks are done by hitting the attack button, which will swing your weapon. Holding a direction will change up what type of strike you do, which you will need to take advantage of to strike certain enemies. There are also special attacks which consume mana, and range from launching an enemy into the air, to firing a blast from your weapon. You can choose which special to use by holding a direction on the left stick when you hit the button, but you can also map these attacks to directions on the right stick which comes in handy for combos. As you strike enemies, your meter builds up, and when full you can go into a state that allows you to attack infinitely until your meter runs out. This includes using your special attacks without consuming mana. Battling enemies grants you EXP, which eventually raises your level and unlocking new special attacks, raises your stats and, well, everything you’ve come to expect from levelling up in games. You don’t attack alone, having up to three other members of your party joining you. When you gain EXP though, everyone in the party gets experience, not just those that participated in battle. This is great, as it allows you to just concentrate on the story and gameplay, rather than micromanaging your party members to make sure they all level evenly. Before engaging in battle, you can fire a blast from your ring which can stun or stagger enemies in the world. If an enemy is staggered, you get the drop on the creatures, allowing you an opening to strike first in battle. Stunned enemies cannot be engaged, and allows you to just pass them by without having to get into a fight. As someone who wanted to engage in every battle, the stunned enemies annoyed me, as I would have preferred to be able to get the first strike on all enemies I wanted to fight, though this is a minor gripe. There is a visual novel element to the game, which I very much enjoyed. Every so often, a prompt would appear at the bottom of the screen to press the minus button, and doing so would start up dialogue between the party members. This gives you more insight into the characters, and was very often humorous, making laugh out loud on multiple occasions. These moments are done between framed anime-style photos of the party members. The visual style of the game is extremely impressive, especially considering that this game is over 10 years old now. It has a look reminiscent of an anime that has been morphed into a 3D world, which is really striking. The true beauty is with the character models though, which are truly stunning. The way this art style holds up reminds me of The Wind Waker, in that they have gone for a type of visual style that is just timeless, rather than something more realistic that won’t age as well. Because of this, the game is still quite a looker even now. In terms of the audio, everything here is superb. From the clanging of swords and activation of special moves to the beastly growls of ferocious monsters, the world just feels alive and vibrant. Add in a top-notch voiceover in both Japanese as well as English, and you have the recipe for a great sounding game. That isn’t even talking about the music, which is absolutely stellar. There were some problems I experienced with this version of the game though. Three separate times I had the game throw up an error screen, throwing me back to the Switch home screen. Each time had me lose a lot of progress as the game does not have any form of autosave. The worst one had me lose over 6 hours of play, which really hurt. The portable nature of the Switch means that a lot of the time I will put the console into sleep mode without thinking of saving, which means I don’t tend to save as often as I would on other platforms. When a game crashes like this, it is a lot more damaging than it otherwise would have been, which is a real shame. Tales of Vesperia: Definitive Edition is arguably the best that the Tales series has ever been. With a rich story, interesting cast of characters, beautiful visuals, excellent voice over and an amazing soundtrack, the game still holds up more than 10 years on from the original’s release. The gameplay is still as fun and engaging as ever, and the added content in this version makes replaying it more than worth it, especially for new character Patty Fleur. Game crashes are a rare occurrence, but they do happen and are something to be aware of, so if you get into this one, make sure to save often.